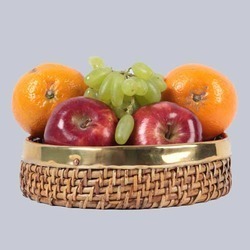 We are offering Round Cane Tray. We are known for offering Rectangular Cane Tray with 2 Bowls that can be used for decorative or gifting purpose. Our Rectangular Cane Tray is known for its sturdy design and can easily hold large weight without a sign of crack. As an eminent Manufacturer, Supplier and Exporter of Rectangular Cane Tray in Delhi, we make sure to test the quality of each tray before delivering to the customer. 4.Biodegradable in 3 monthes, compostable and eco-friendly. Being one of the renowned organizations in the industry, we are highly engaged in providing a premium quality range of Cane Tray. - All product/service measurements are taken across the longest/broadest part of the product.